The Cowan Insurance Agency was purchased by JR and Nancy Cowan in the early 1980's from Ira Bridge. The agency was then sold to Tim Craig in 2000 and renamed Performance Insurance Services. It was then acquired by Everett and Diane Hughes in 2007 and renamed Everett Hughes Insurance. The following year it was purchased by Benjamin Schoettmer and rebranded to Hughes Insurance Group. In 2012 Benjamin purchased the Hunter Insurance Agency in Arcadia from Blake Hunter, which was founded by his parents, Max and Judy Hunter in 1949. Blake remains an active part of the agency. In 2012 Benjamin purchase the Westfield branch of the Hobson Insurance Agency from Jasen Hobson. 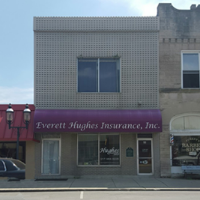 In 2014 Benjamin purchased the Hunter Insurance Agency in Sheridan from Joe Schreiner and consolidated all of the Hamilton County locations into the Cicero, rebranding everything to Hughes Insurance Group.